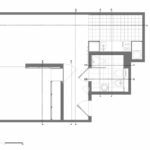 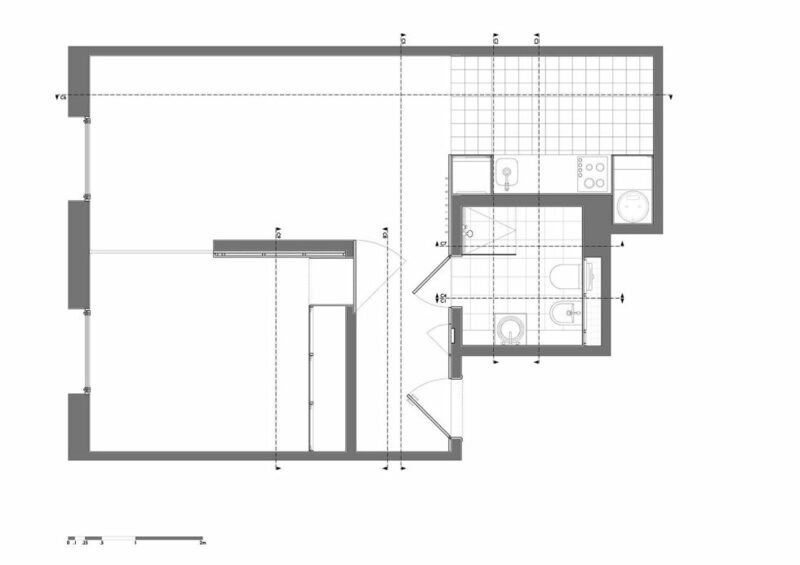 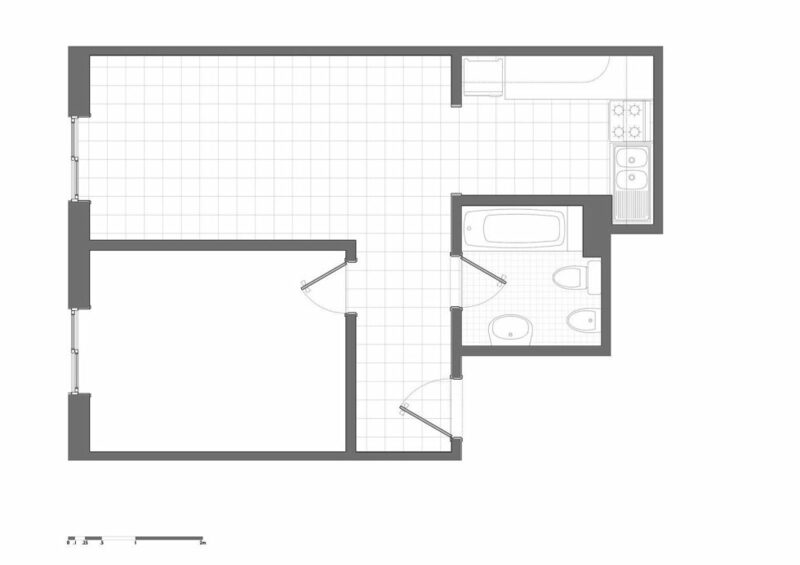 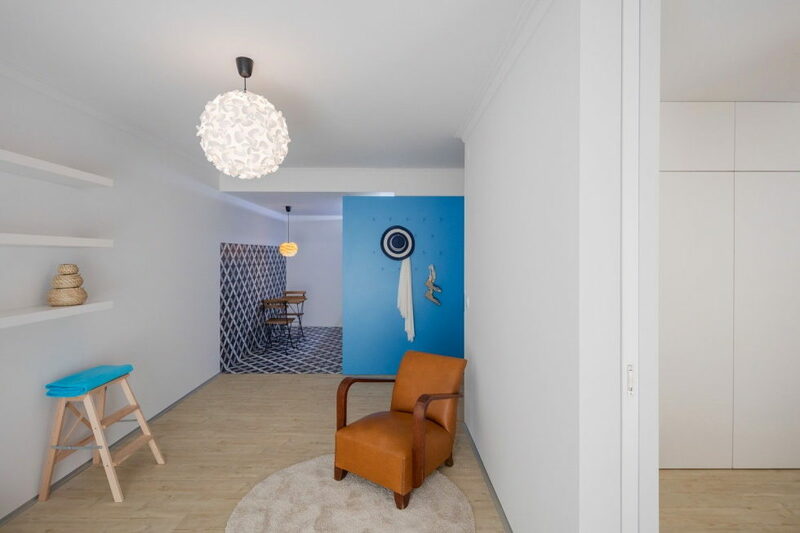 Having started the renovation of this apartment of 40 sq. 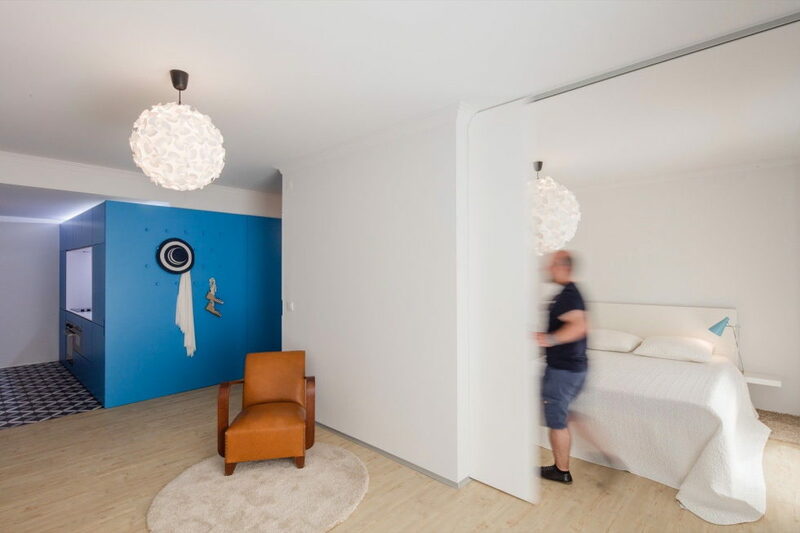 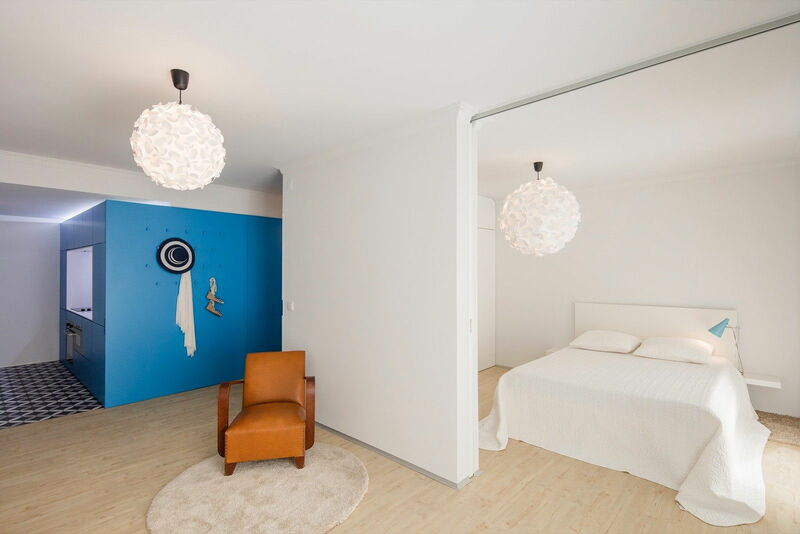 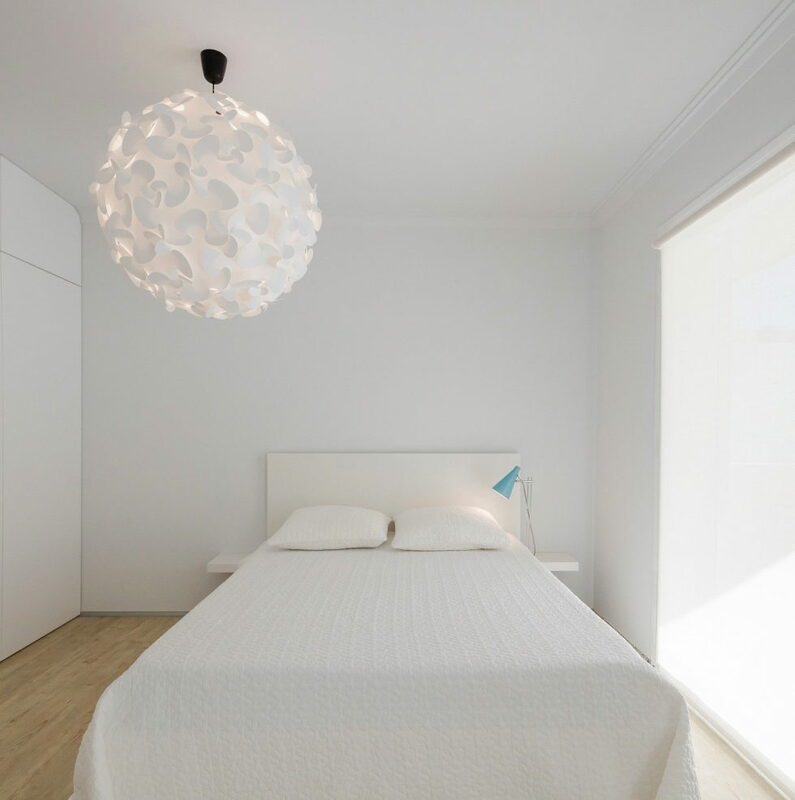 meters, located in a small coastal town in Portugal, Tiago do Vale Arquitectos`s architects were limited not only with its sizes but with a humble funding and customer`s desire to avoid radical reconstruction as well. 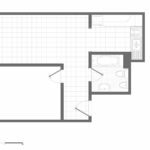 This apartment was constructed at the 80-s, has been in active use for more than thirty years and looks dark and unfriendly at the first glance. 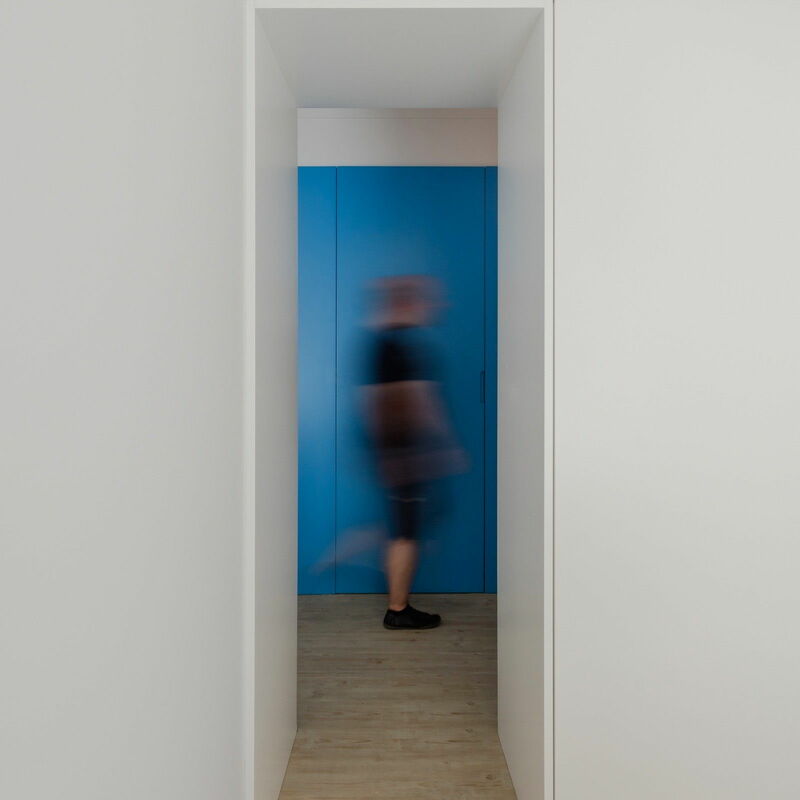 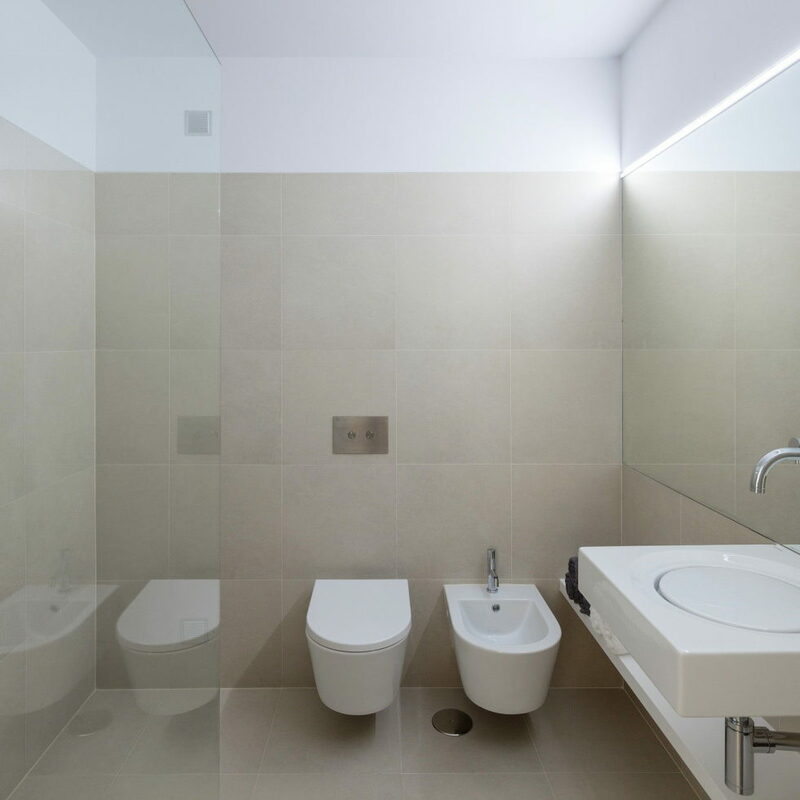 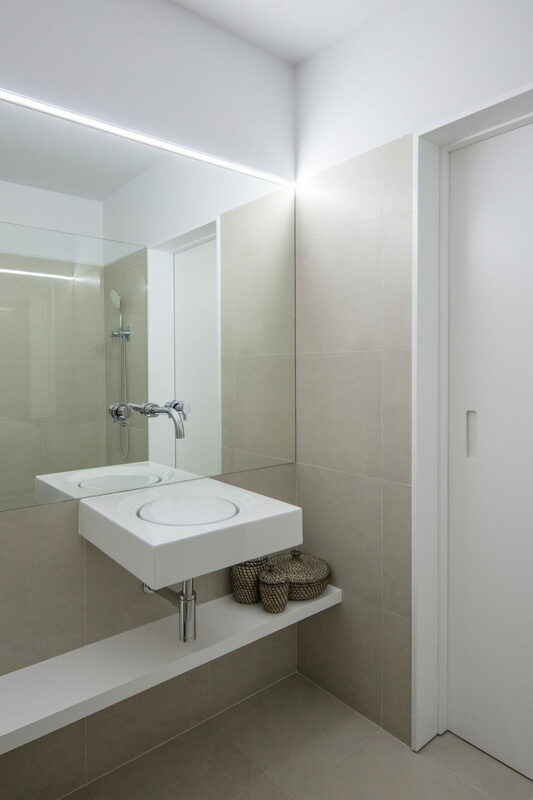 The designer`s strategy was to increase the amount of light and space with minimum materials, mainly with the help of active use of white colour. 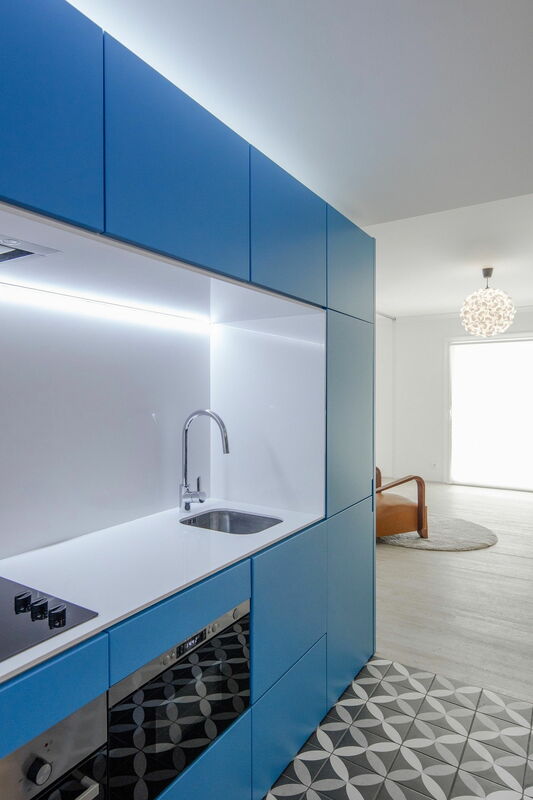 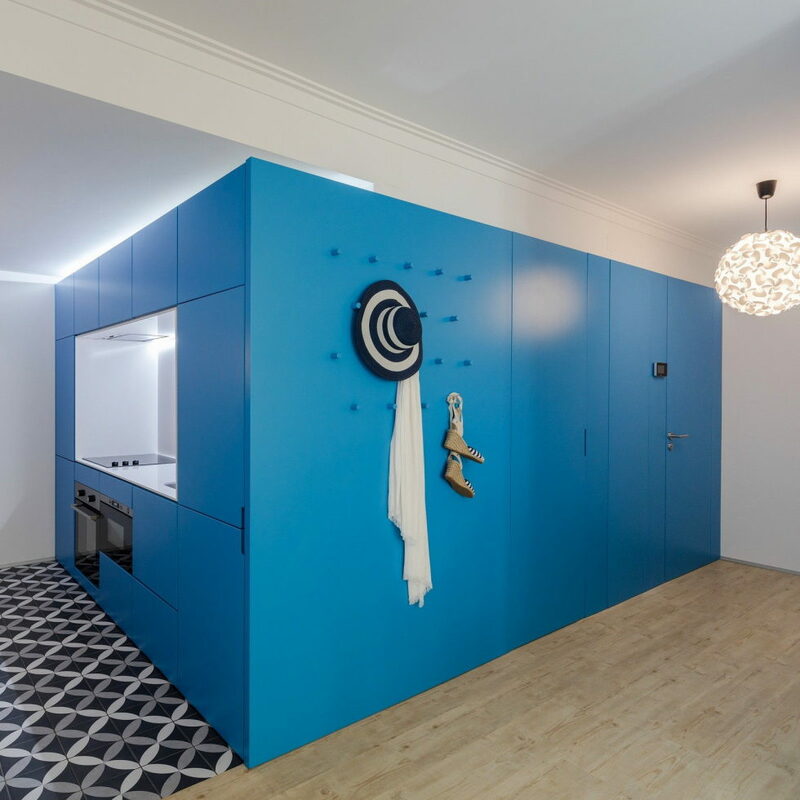 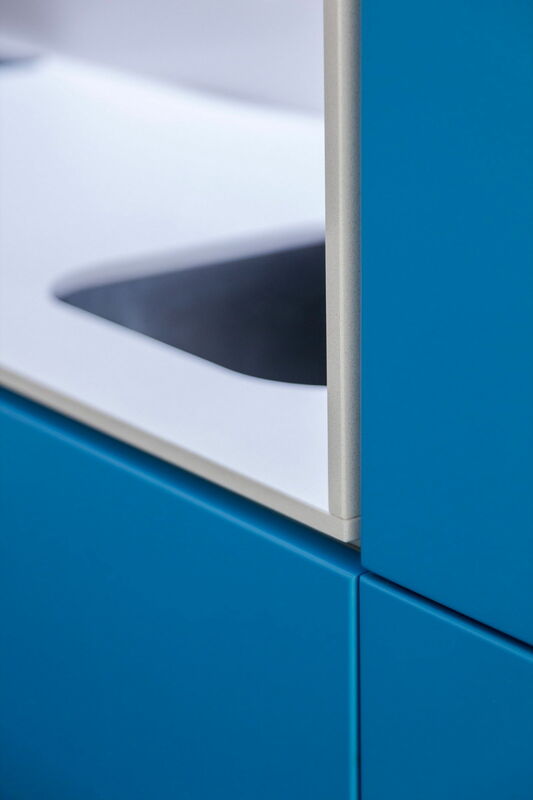 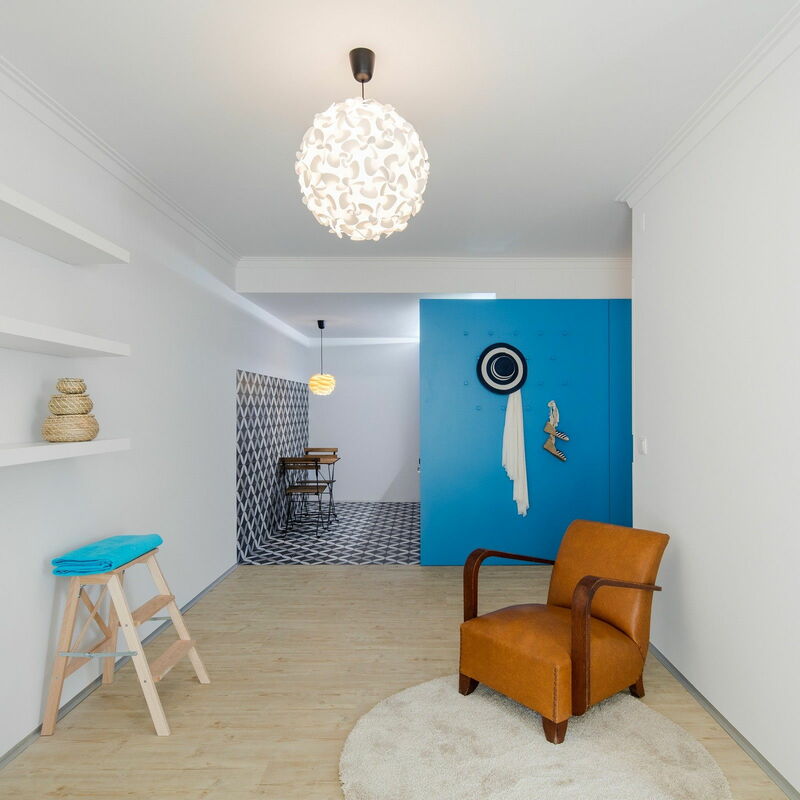 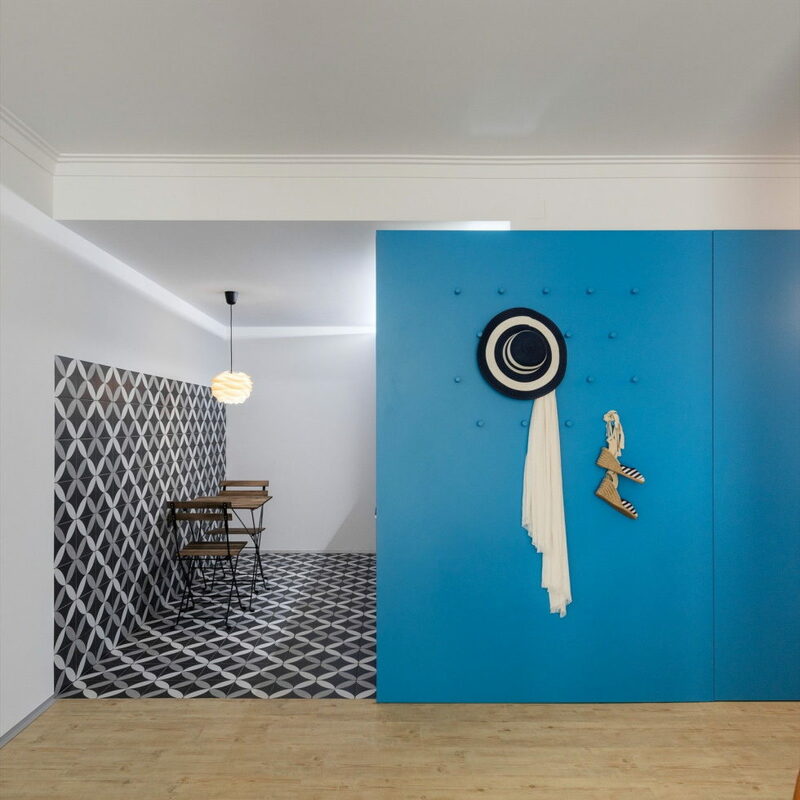 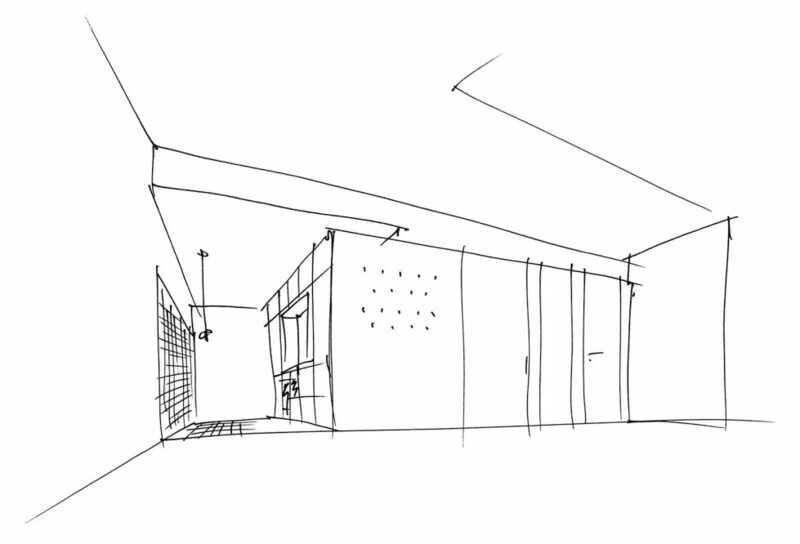 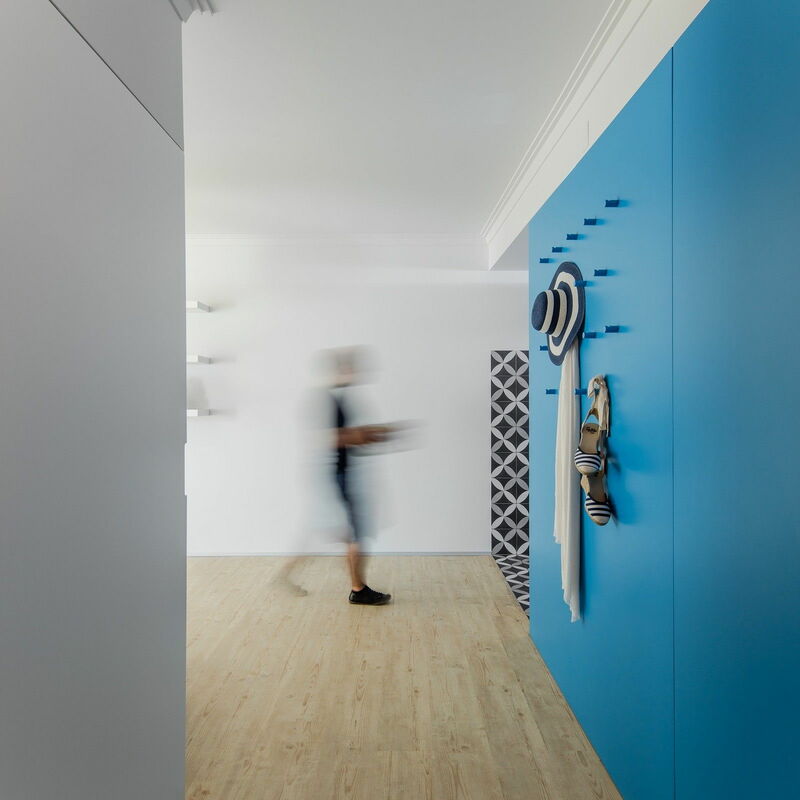 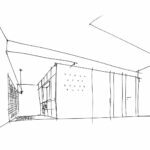 The main emphasis was placed on the blue cubing, a functional part of both entrance and kitchen zones. 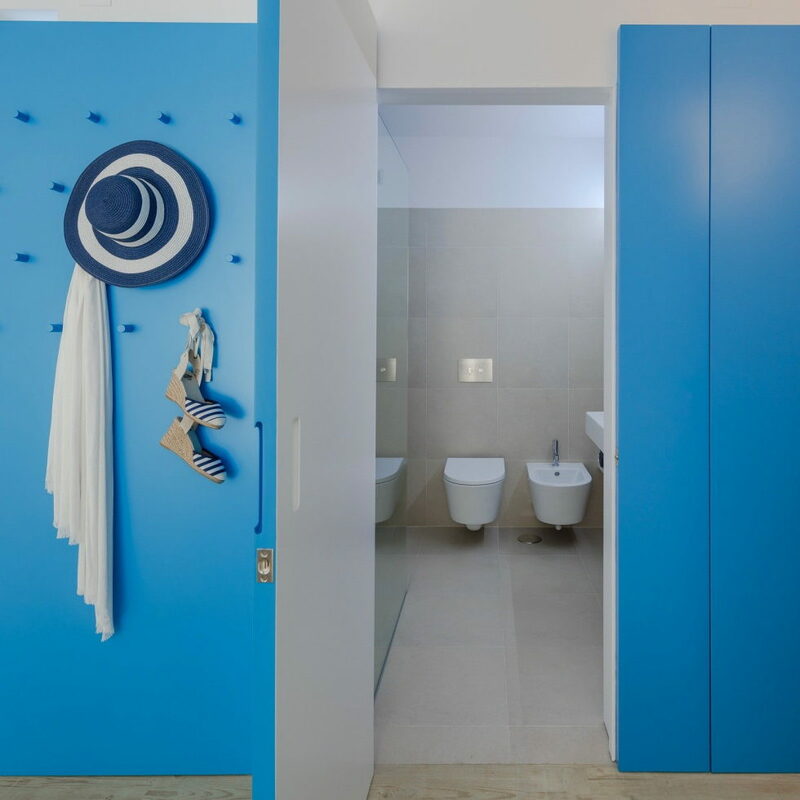 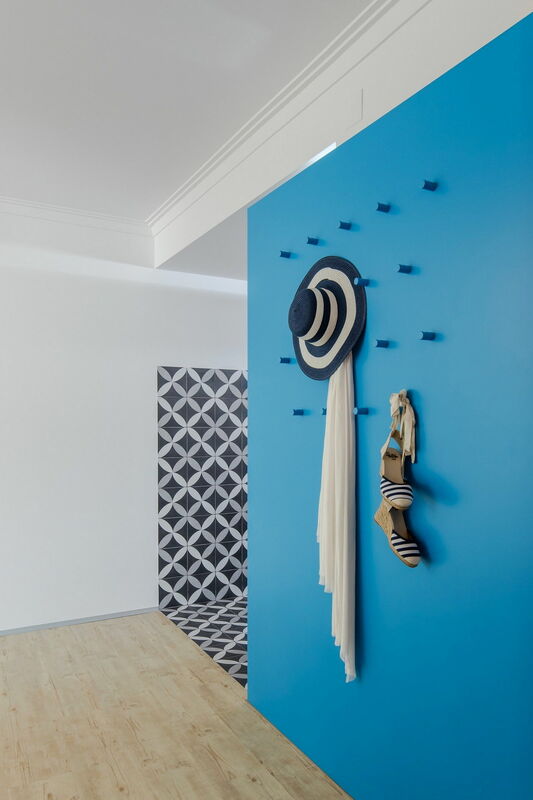 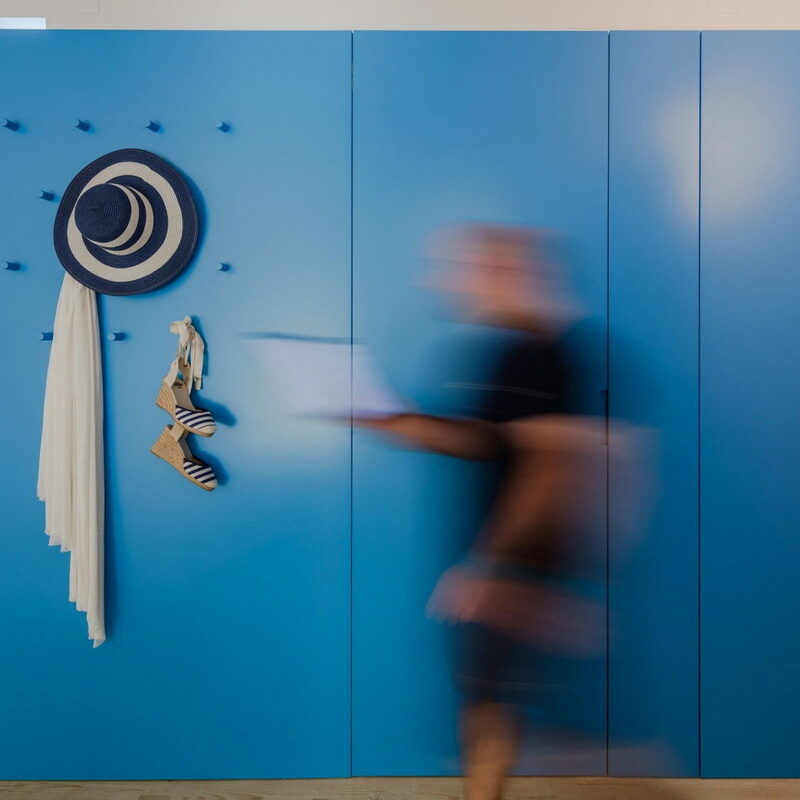 Such architectural solution has brought summer mood to the interior, supported by hooks for beach implements in the hall. 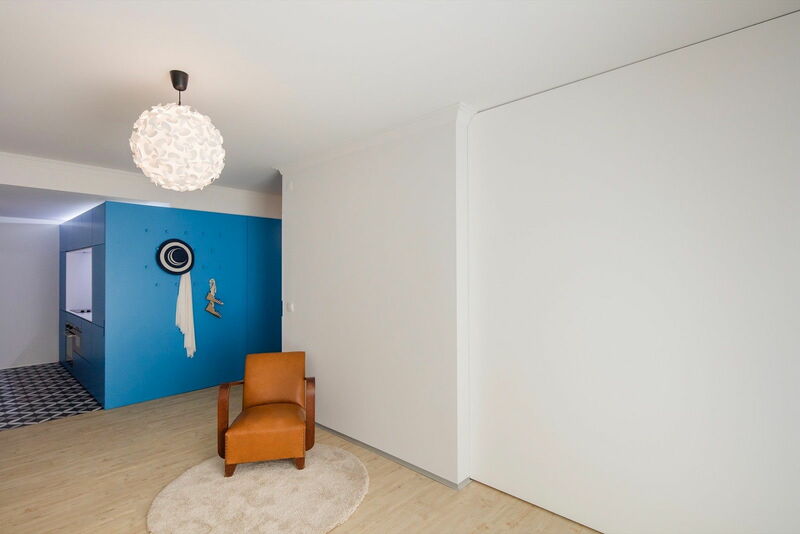 Half of the wall dividing the living room and the bedroom is replaced with a sliding panel. 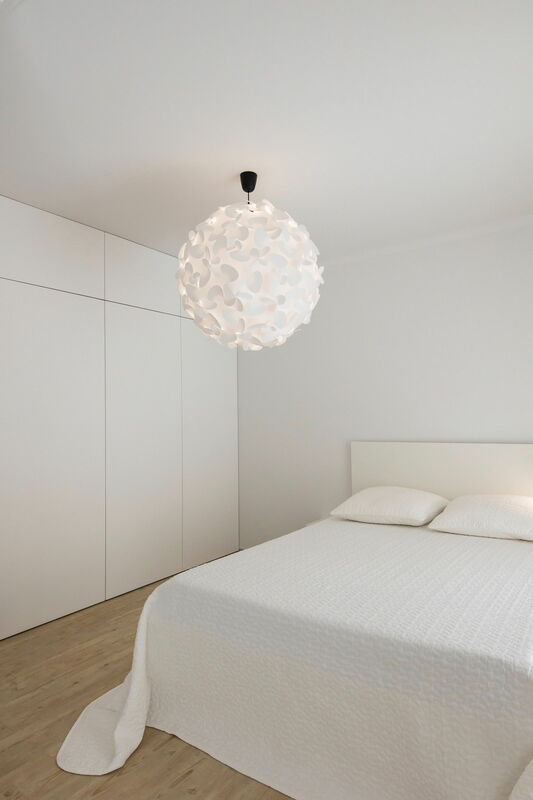 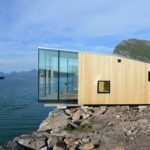 This gives the owner either a possibility to create a unified space or to make the bedroom isolated and private. 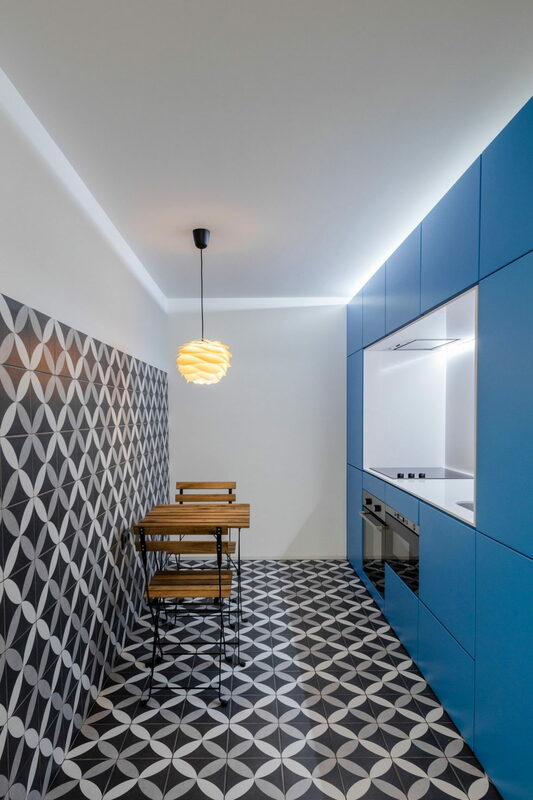 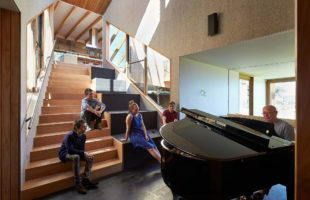 While striving to create unique apartment`s atmosphere, the project`s authors have kept some architectural elements of the 80-s, such as moldings of ceilings. They have also highlighted the kitchen with ornamental tiles. 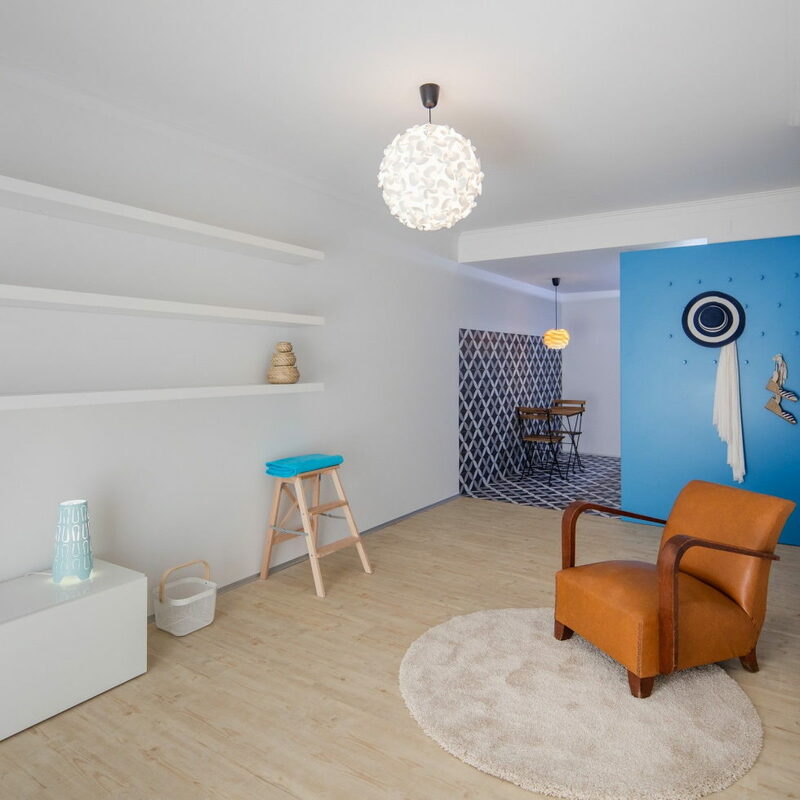 As a result, the small apartment is now filled with relaxation atmosphere and is ready to provide joy and happiness to its residents.